Anyone who spends time in the outdoors, especially photographers, quickly realize that it takes heaps of patience to get close to wildlife. Getting that close-up photograph usually requires a considerable zoom lens. But there is a place where things are a little different — underwater in Palm Beach! Marine life tends to have an inquisitiveness all their own. Once you stop flailing your arms around and hover still for a few seconds all those fleeing sea creatures quickly close the gap between them and your dive mask. Case in point: Today’s sea turtle encounter! It was only a few minutes into my first dive on Midreef today in West Palm Beach that this inquisitive hawksbill sea turtle and I met. These hawksbill sea turtles are typical year-round residents on our reefs who spend their teenage years feeding on a variety of sponges. 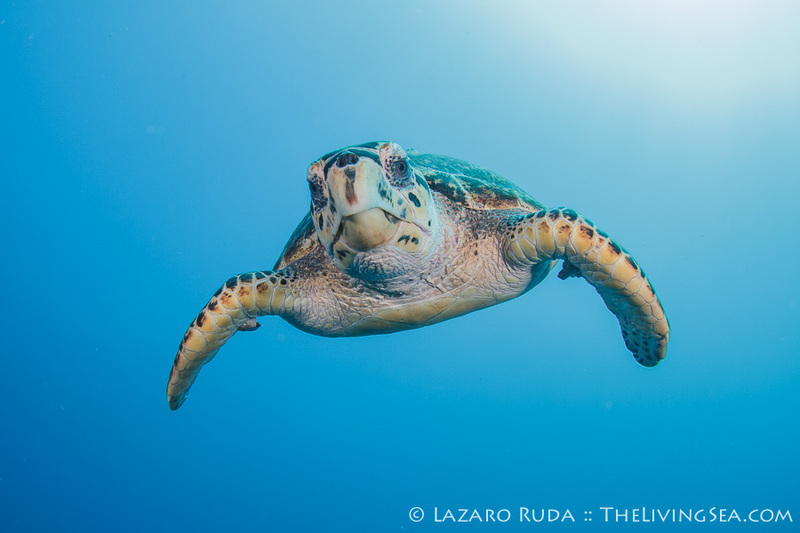 Unlike a lot of wildlife, though, they seem to exhibit little fear of us humans — unless, of course, you harass them, which is illegal, as all sea turtles are protected in the U.S. under the Endangered Species Act. I kept a good fifteen foot distance from this hawksbill sea turtle for over ten minutes. The group of divers eventually showed up, got a close look at the sea turtle, and continued on with their dive. The whole time the hawksbill sea turtle barely moved a muscle. It wasn’t until a few minutes later that things started to get interesting. As if complaining as to why all the divers didn’t stay a while, the hawksbill floated off the bottom, crossed his flippers, and gave out a big (silent) sigh! I watched him swim to the surface and spend a few minutes taking in a couple of breaths of air. I always worry when I see turtles near the surface, as I concern myself with boaters who aren’t watching where they are going and accidentally collide with these sea turtles. We lose many sea turtles every year due to boat strikes. If you are a boater, or know someone who is, please do not run at full speed over the reefs and be mindful of where you’re going, for the sea turtles (and divers) sake! Upon the hawksbill sea turtles return, he came barreling right past me and began looking for some sponges to eat. As I swam alongside it observing it go about its life, numerous times the sea turtle would swim right towards me. One time stopping in real close to see its reflection on the front of the glass dome of my underwater camera. It eventually found some sponges to snack on, and only a few feet away I watched in delight. The beauty of this encounter is that it’s not rare and many times you can spend a whole dive observing these amazing sea turtles. This is one of the many benefits of encountering wildlife below the waves. Scuba diving offers some of the best, up-close wildlife encounters you can experience, and if you’re looking for the best sea turtle encounters then scuba diving in West Palm Beach is your best bet. 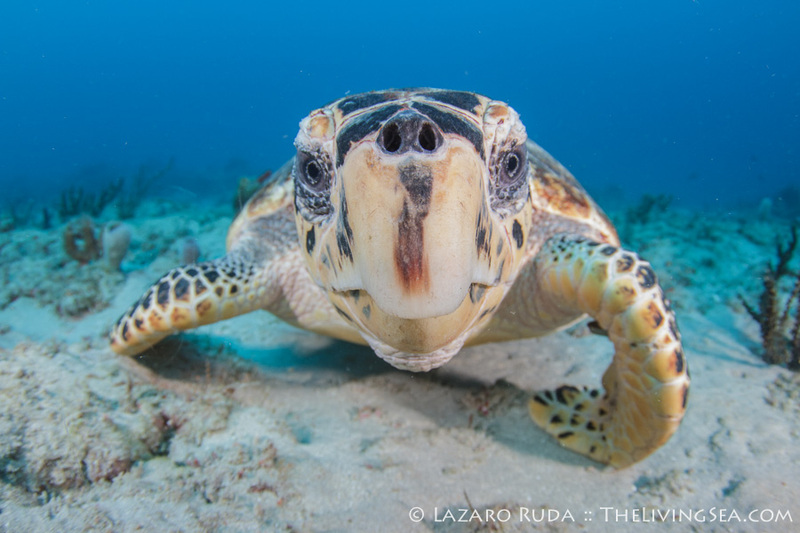 A hawksbill checks out his reflection in the camera’s dome port. But wait! This was just the first dive in Palm Beach. On my second dive I decided to try some more up-close wildlife encounters with the countless fish that live on the reefs. Here are a few of the photos I captured. Come experience the best scuba diving in Florida! Dive with Walker’s Dive Charters in West Palm Beach. A little in-camera photo fun!